ROYAL CANIN Appetite Control Sterilised 7+ Dry Adult Senior Cat Food is both delicious and nutritious! Some neutered, mature cats have a tendency to beg for food, even after eating the recommended daily allowance. If your cat has exhibited this sort of behaviour, a change in its diet may be in order to help induce a feeling of fullness without contributing to excess weight gain. ROYAL CANIN Appetite Control Sterilised 7+ is specially formulated with all the nutritional needs of your neutered, mature cat in mind. To help your cat face the first signs of ageing, ROYAL CANIN Appetite Control Sterilised 7+ is enriched with targeted nutrients such as: green tea polyphenols, vitamin C, EPA and DHA. EPA and DHA are Omega-3 fatty acids that help to support and maintain your cat’s bone and joint health. ROYAL CANIN Appetite Control Sterilised 7+ contains a moderate level of fat (12%) and specially sourced fibres. These nutrients not only limit your cat’s calorie intake, they also satisfy the appetite of cats that have a general tendency to beg for food. Regulating your cat’s hunger will also help it maintain an ideal and healthy weight, which also helps to support joint and bone health. To support your cat’s renal health, ROYAL CANIN Appetite Control Sterilised 7+ contains a specially adapted phosphorus level – contributing to the maintenance of healthy kidney function. 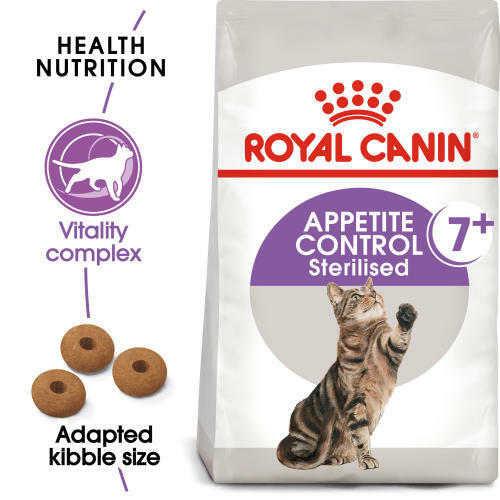 What’s more, ROYAL CANIN Appetite Control Sterilised 7+ is also formulated with a specific balance of minerals that help to support and maintain your neutered, adult cat’s urinary system. At ROYAL CANIN we’re committed to providing nutritional solutions to your pet’s needs. All of our products undergo an extensive quality control process in order to guarantee the optimum quality of food as well as catering to your cat’s specific dietary requirements and lifestyle. This means that when your cat eats ROYAL CANIN Appetite Control Sterilised 7+, it’s getting a complete and balanced diet. Vitality complex - To help cats face the first signs of ageing, APPETITE CONTROL STERILISED 7+ is enriched with targeted nutrients including green tea polyphenols, vitamin C, EPA and DHA. Hunger regulation - Contains a moderate level of fat (12%) and specific fibres which satisfy the appetite of cats with a tendency to beg for food and limit calorie intake. Renal health - Helps support renal health thanks to an adapted phosphorus level. Urinary health - Formulated to help maintain health of an adult cat’s urinary system. Additives: Vitamin A: 19000 IU, Vitamin D3: 700 IU, Vitamin C: 200 mg, E1 (Iron): 36 mg, E2 (Iodine): 3.6 mg, E4 (Copper): 11 mg, E5 (Manganese): 47 mg, E6 (Zinc): 140 mg, E8 (Selenium): 0.06 mg - Technological additives: Clinoptilolite of sedimentary origin: 10 g - Sensory additives: tea extract (source of polyphenols): 0.6 g - Preservatives - Antioxidants. *L.I.P. : protein selected for its very high assimilation. Composition: Vegetable protein isolate*, maize, dehydrated poultry protein, vegetable fibres, wheat, maize gluten, animal fats, hydrolysed animal proteins, rice, minerals, beet pulp, yeasts and parts thereof, fish oil, soya oil, fructo-oligo-saccharides, psyllium husks and seeds, hydrolysed crustaceans (source of glucosamine), marigold extract (source of lutein), hydrolysed cartilage (source of chondroitin). Crude ash: 7.5%. Crude fibre: 9.2%. Crude oil fats: 12%. Moisture: 0%. Protein: 34%.